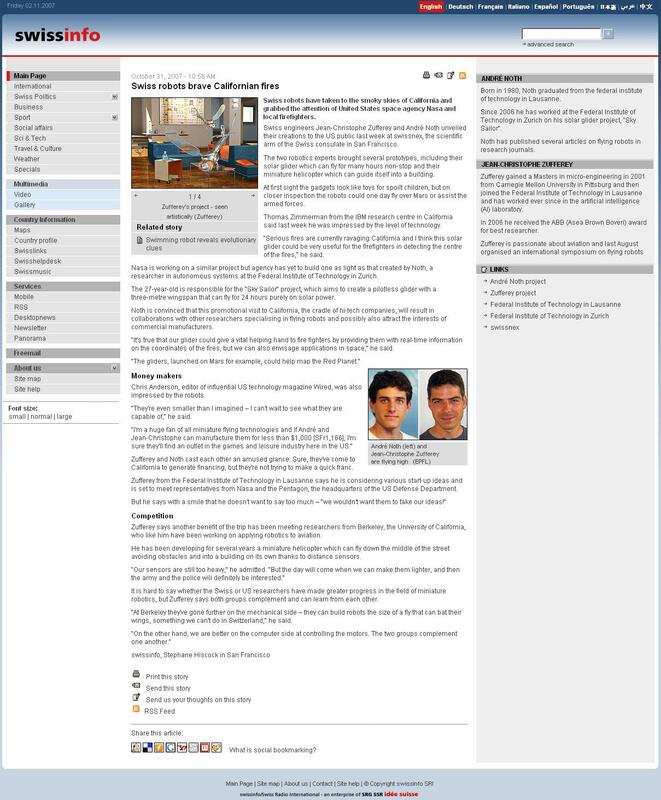 Dec 2008: Conceptual Design Program [Matlab] . 21st of June 2008 : NEW Continuous flight was demonstrated during a solar powered flight of more than 27 hours over 874.4 km what represents a Zürich-London trip. This is a world record for this size and using no thermal winds or altitude gain before the night. Detailled Report [pdf] ETH Life Artikel (German). The goal of this project is to design and build a solar powered micro airplane for autonomous exploration. This system, named Sky-Sailor, is fully autonomous in navigation and power generation. Equipped with solar cells covering its wing, it retrieves energy from the sun in order to supply power to the propulsion system and the control electronics, and charge the battery with the surplus of energy. During the night, the only energy available comes from the battery, which discharges slowly until the next morning when a new cycle starts. This project started in 2004 under a contract with European Space Agency to study the feasibility of a Martian Solair Airplane. The first prototype weighs 2.6 kg for a wingspan of 3.2 meters. The 216 silicone solar cells are able to deliver up to 90 W at noon during summer whereas the power consumption of the airplane is 16 W at level flight. The longest flight so far lasted 5 hours, but measurements validated the design and prove that 24h is possible. This attempt will be done this summer 2007. 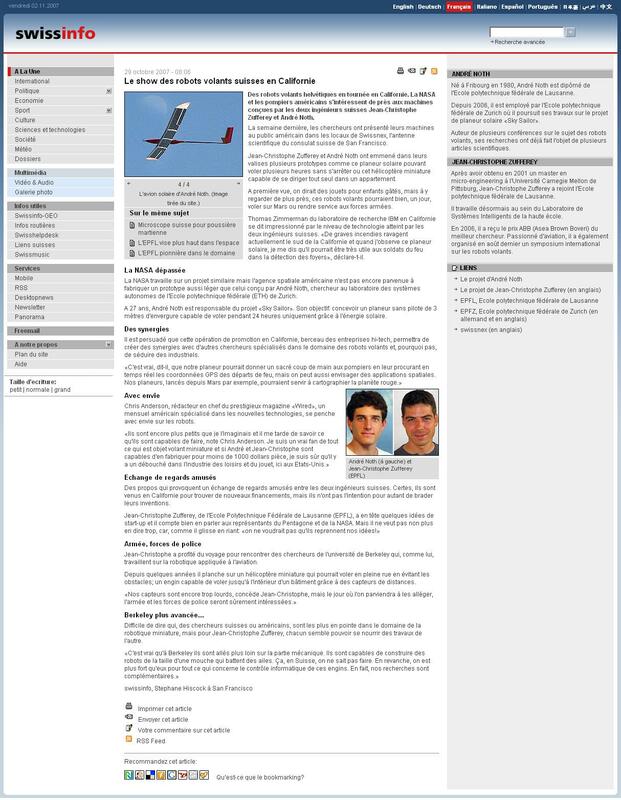 Summer 2007 : Long duration flights were attempted. 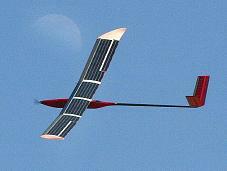 Sky-Sailor flew two times more than 10 hours autonomously, 330 km, using solely solar energy. 21th of June 2008 : NEW Continuous flight was demonstrated during a solar powered flight of more than 27 hours over 874.4 km what represents a Zürich-London trip. This is a world record for this size and using no thermal winds or altitude gain before the night. Detailled Report [pdf] ETH Life Artikel (German).